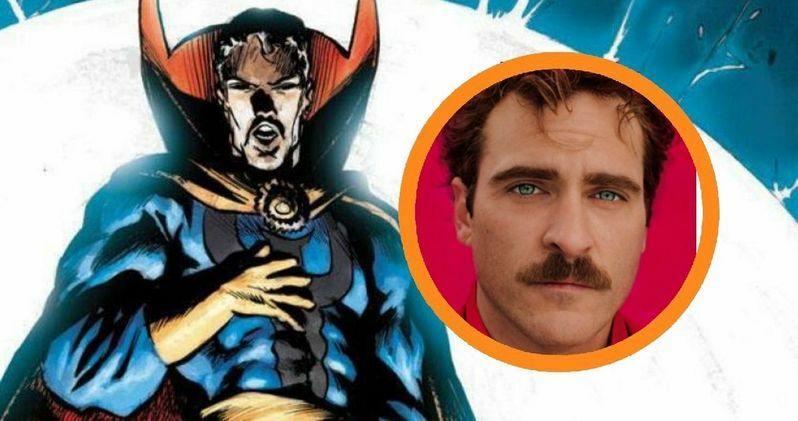 While Benedict Cumberbatch and Tom Hardy have been previously rumored to play Doctor Strange, a new report believes that Joaquin Phoenix will be announce as Marvel's next leading man this Saturday during their Comic-Con 2014 panel. Marvel is said to still be finalizing their planes for Saturday, which means talks must be on-going at this very second. Doctor Strange director Scott Derrickson is expected to make an appearance on Saturday, though Marvel and Disney have no comment. Deadline, though, has confirmed the actor is in talks. It is believed that no deal is in place yet, but Joaquin Phoenix has had discussions about the project. It's speculated that Joaquin Phoenix wouldn't want to sign a long term contract with Marvel, which the studio requires of its actors. But this may be a special case with the actor signing on a per movie basis. Joaquin Phoenix was previously rumored for the Lex Luthor role in Batman v Superman: Dawn of Justice, but that part eventually went to Jesse Eisenberg. The actor is known for taking on more challenging roles in independent fare and acclaimed dramas. Some think it is odd that he is targeting a superhero movie. It's believed that his recent co-stars and Marvel alums Jeremy Renner (The Immigrant), Scarlett Johansson (Her), and Josh Brolin (Inherent Vice) have been pitching him on the pros of joining the Marvel family. Jared Leto and Justin Theroux have also been named as possible contenders for Doctor Strange, which hasn't been given a release date, but is part of Marvel's planned Phase Three. Yesterday at Comic-Con, Benedict Cumberbatch wouldn't say if he was appraoched for the project, but did say it wouldn't fit into his current schedule.